MONTANA were considered by some as the best musical act to come of out of the Big Sky State, with that quote from none other than Willie Nelson. 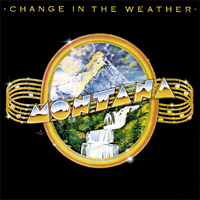 Released in 1981, the album “Change In The Weather” features country rock from a band that were noted for their vocal harmonies. The band became best known for their single “The Shoes On The Other Foot Tonight”. Tragedy struck in 1987 after the band had played a 4th July gig in Montana when their private plane crashed into trees after take-off killing all ten people on board, including original band members Terry Robinson and Kurt Bergeron. Now released on CD for the first time. The music is well played, easy on the ear melodic country rock - not dissimilar to Alabama, Poco and the Little River Band - from the aptly named 'Dreamer' and 'Snowfall On A Mountain', which puts the band's harmony vocals to good effect. They had a hit back in the day with 'The Shoes On The Other Foot Tonight', a song made for a road trip playlist and featuring sublime pedal steel guitar playing. Their name may not be too familiar to punters on this side of the Atlantic but this affable county-rock outfit were a musical force to be reckoned with in the area around their home state of Montana during the early eighties before the five band members perished in a tragic plane crash in July 1987. Tight vocal harmonies and polished musicianship are the order of the day throughout this easy on the ear package from 1981, with the title track and "The Shoe's On The Other Foot Tonight" emerging as the best of a tuneful bunch.